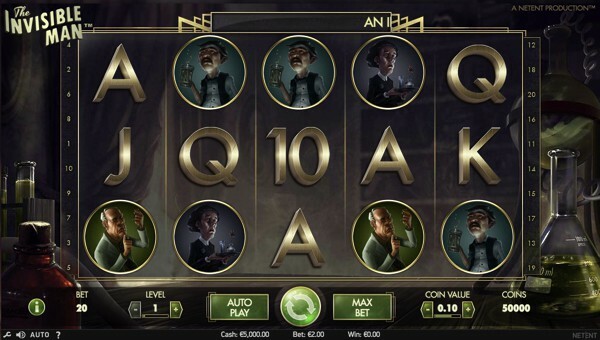 The Invisible Man is an online video slot based on the novel by H.G Wells written in 1897 and is also considered one of the best horror movies of all time. Developed by Net Entertainment, The Invisible Man is presented on 5 reels with three rows and features 20 pay lines. This action-themed video slot offers amazing bonus features that include two wild symbols, a free spin feature, walking wilds and a top paying jackpot bonus worth 500 coins for you to collect on the reels. The background takes place inside a laboratory with several different beakers, test tubes and flasks placed around the reels with different liquids in each of them. The semi-transparent reels are framed in industrial art deco with gold coatings on the pay lines, symbols and on the betting platform to add to the look and feel of the theme. There is a total of five different characters from the book including Mrs. Hall, Mr. Hall, Dr. Cranley, Arthur Kemp and Flora Cranley, completing the high valued symbols on the reels. The lower valued symbols include 10, J, Q, K and Ace to complete the set of symbols presented on the reels. Before attempting to solve the mystery of this legendary slot game, you will first need to set your desired betting value with the betting options provided below the reels. The coin denominations range from the lowest of £0.01 to a maximum of £0.50. You can also select between the 10 betting levels, making the minimum bet per spin £0.20 and the maximum you can bet on a single spin £100.00. There are two special symbols available in the game that consist of a policeman acting as a wild symbol and the invisible man himself representing an additional wild symbol on the reels. Both are key symbols to unlocking the bonus features within the game. In the base game, a wild policeman symbol on reel one or a wild invisible man symbol on reel five will start moving across the reels, one reel at a time, accumulating pay outs on its way. Every re-spin is free until the wild symbols drop off the screen. If an invisible man and policeman wild merge on the reels, you will be awarded with 10 free spins. Additional wild symbols can also appear during the feature and if they merge again, you will be awarded an extra 4 free spins. You will also discover two meters displayed above the reels with 8 spaces. Every time a wild symbol drops off the screen, the meter is filled with one space. If one of the meters is full, an additional bonus game will start that corresponds with one of the wild symbol characters. Police Spins: You will be awarded with 3 free spins and an extra 5 wild symbols added to the reels with every spin. Griffin’s Rage: The invisible man will get to visit three locations, namely Ipping Station, The Mansion and Lions Head Inn. You will get to choose one of five items in every location to reward you with multipliers and coin prizes. The game will end prematurely when a red police hat is discovered. The Invisible Man provides an excellent Return to Player ratio of 96.10% and with a volatility level ranging between low and medium, you will receive more frequent pay outs that might be low in coin value but will ultimately prolong your gaming experience. We have embedded a demo version of The Invisible Man below so that you can try the game for free.